I had so much fun working on this card. I used striped washi tape on the base cardstock... am I the last person to discover washi tape? I received a few rolls in my Simon Says kits last year, but I'm starting to use it on a regular basis and I LOVE it! 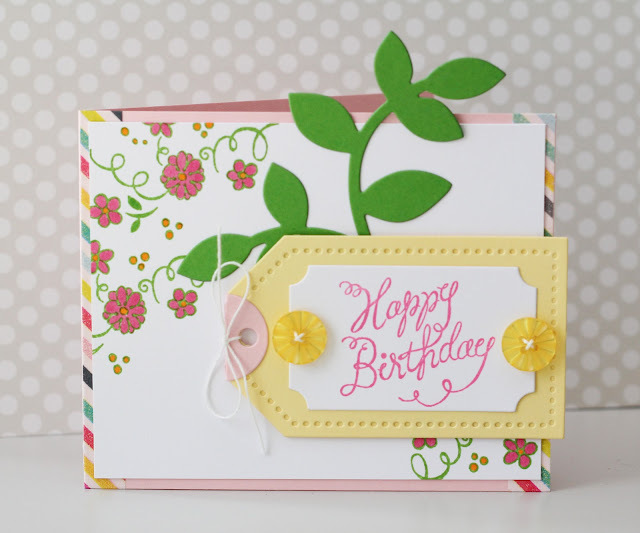 I used two Great Impressions stamps: Whimsical Happy Birthday and Fun Flower Background. I stamped the flower background with Papertrey Ink's New Leaf ink then colored in the flowers, leaves, and mini circles with Copic markers. I stamped the Happy Birthday image on a die cut frame before adhering it to the tag. The leaves were die cut from New Leaf cardstock and the beautiful yellow buttons are Doodlebug. I hope you have a great week! And make sure to check out our monthly challenge... I've been hopping along to the projects already submitted and they are gorgeous! Into my Erin favorites this one goes! Love the design and happy feel!